The ProMaster TRAVELER + LITHIUM ION BATTERY CHARGER is a versatile, compact, go anywhere charger for your Li-ION digital camera and camcorder batteries. The Traveler + charger features a built in switching power supply that can be powered from either 110v - 240v AC or 12V DC (optional DC power cord required) for true worldwide compatibility. Combined with the USB power output port and its compact size, it makes a PERFECT solution for those on the go or to use at home. 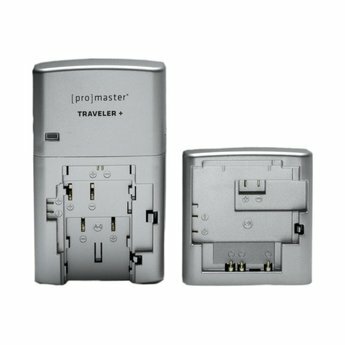 The ProMaster Traveler + charger is available in models to fit most Li-ION digital camera batteries.